Can you imagine teaching your children a Bible story in your kitchen while baking? 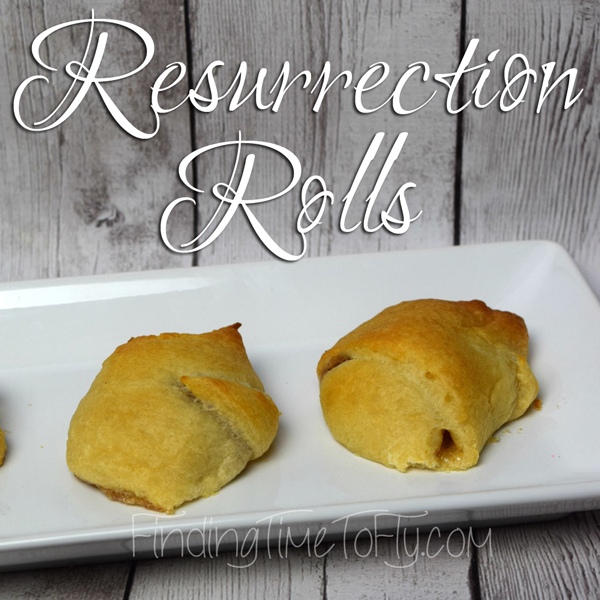 That’s exactly what you’ll be doing as you make these delicious Resurrection Rolls. Each step in the process of preparing and baking these Resurrection Rolls represents part of the Easter Story. You’ll be amazed how much scripture your children will eagerly listen to as you bake together. You’ll need only a few, simple ingredients. Read John 19 while the oven preheats according to the package directions on the crescent roll package. Explain that the marshmallow represents Jesus. White represents purity and being without sin. Coat the marshmallow in butter. The butter represents the embalming oils. 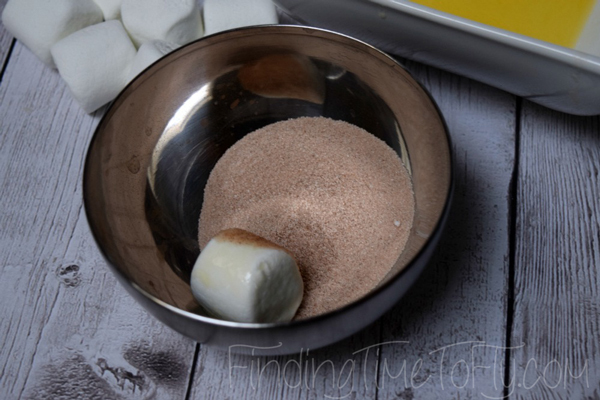 After coating the marshmallow with butter, next place it in the cinnamon and sugar mixture. This represents the spices used to prepare Jesus’ body for burial. These marshmallows are ready to be covered by crescent rolls! 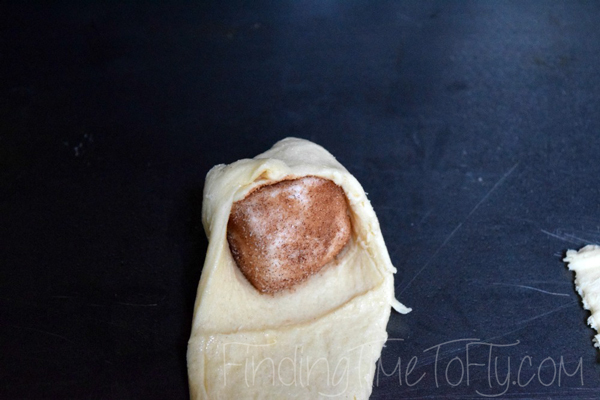 The crescent roll represents the cloth used to wrap Jesus’ body. 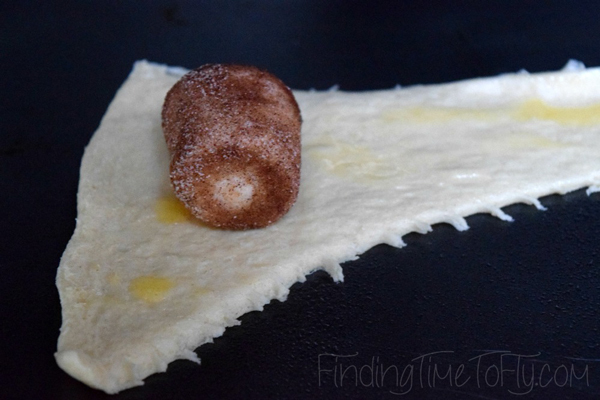 Place a marshmallow on the wide end of the crescent roll dough, then roll it up being sure it’s completely covered. You don’t want any of the marshmallow peeking out. It doesn’t really matter what shape these end up being. Just pinch closed any openings and make sure the marshmallow is covered. 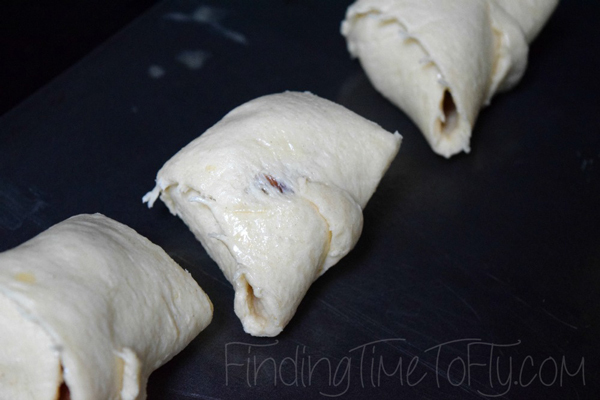 Allow the rolls to cool a little before opening them up. When opening the Resurrection Rolls, read 1 Thessalonians 4:16-18. 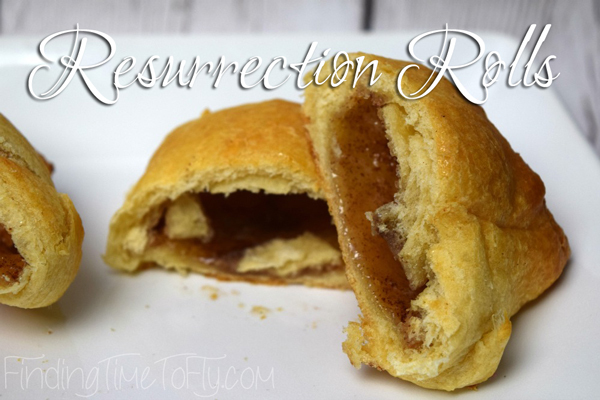 This recipe will help teach the Easter Story in an unforgettable way. They are also delicious! While the oven is preheating according to the crescent roll dough package directions, read John 19. You could spend the week leading up to Easter reading John 12-18 to your kids if you remember to plan ahead that far. Unroll and separate the crescent roll dough explaining that this represents the cloth used to wrap Jesus in. Give your child a marshmallow explaining that it represents Jesus...pure, white, without sin. 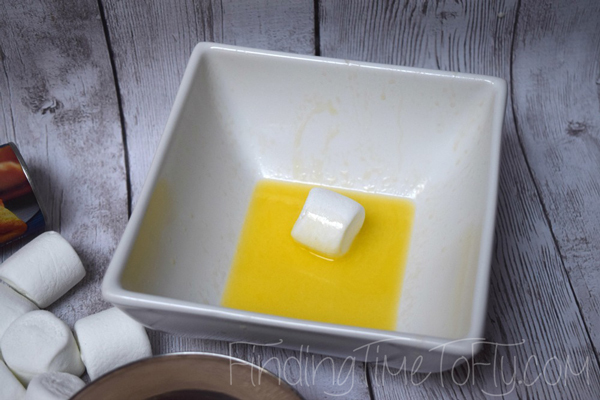 Roll the marshmallow in the melted butter. This symbolizes the embalming oils. Roll the marshmallow in the cinnamon/sugar mixture. This represents the spices used to prepare the body for burial. 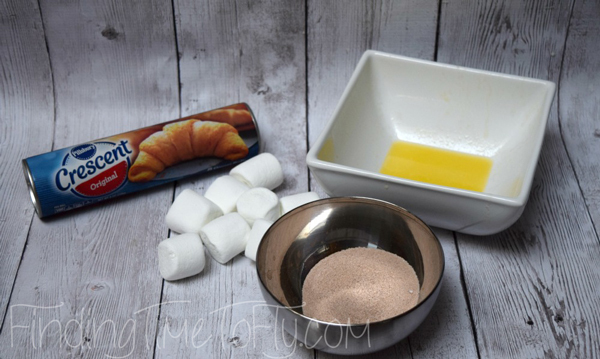 If desired, you can brush the crescent rolls with butter before wrapping the marshmallows. 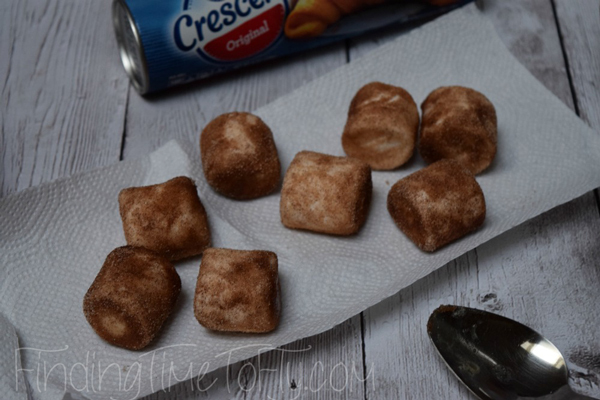 Wrap each marshmallow in a crescent roll cloth, pinching the dough together so none of the marshmallow shows. The shape of the rolls is not important. This represents how they wrapped Jesus' body. Place the rolls into the oven which symbolizes the tomb and bake according to the crescent roll package directions. 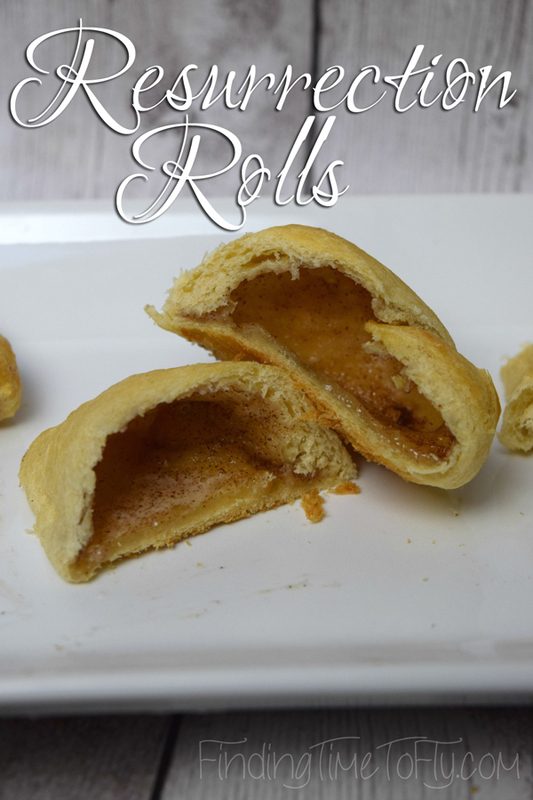 Read John 20:1-18 while the rolls are baking. Open the oven (the tomb) and remove the rolls. Wait for them to cool enough to comfortably handle. Break them open and discover what happened to the marshmallow. Jesus is risen! He is no longer in the tomb! Conclude by reading 1 Thessalonians 4:16-18. Jesus is coming again! Welcome to Finding Time To Fly!